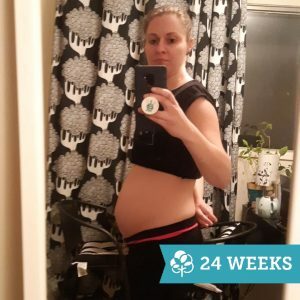 Today (October 12) I am 24 weeks pregnant. I had my first appointment with my new doctor today. He was a very nice doctor. He works as part of a team with the hospital I plan to give birth in. What that means is he may or may not be the doctor that actually delivers my baby. The appointment was pretty quick and straight forward. They took my blood pressure and weight. They didn’t take a urine sample which was the first time since I started my prenatal appointments. The doctor measured my uterus, listened to the baby’s heart beat (which I believe was about 156 bpm) and gave us information about upcoming appointments. He said my baby was very excited and was able to find the heart beat as soon as he put it on my stomach. As for upcoming appointments, I was given forms to book my gestational diabetes screening test, urine test, and an ultrasound. I will have those appointments in four weeks and then the following week I will have a follow up appointment with my doctor. Actually, it will be with another new doctor because the one I saw today is not in on the day I wanted to book my appointment. Up to this point, my appointments have been about once every 4 weeks. After my follow up appointment in 5 weeks I should start having appointments every two weeks. I can’t believe I’m almost at that point already! Another change will be that my boyfriend will no longer be able to come to all my appointments now that he is working again and the appointments are becoming more frequent. But he’s okay with that as I feel like they aren’t as exciting as they were in the beginning. That’s a lot to do when you’re pregnant but I definitely know that it’s worth the health of the baby. Congrats again! I can’t imagine how you’re feeling or thinking about this but I am still so happy for you.